Gardens in New Jersey collectively offer more than 3,250 acres of biological diversity and beauty with Spring and Summer being the prime time when picket-fence gates are swinging open for visitors. Classes and workshops are offered at Morven, The Cross Estate Gardens, and The Frelinghuysen Arboretum to name a few. A day trip to the exceptional Longwood Gardens in Kennett Square, PA is a great idea for those who appreciate all things floral. The Avis Campbell Gardens recreate superb English-style gardens. Once the home of Martha Brooks Hutcheson, one of the first American female landscape architects, these 100 acres include fields, woodlands and formal, yet naturalistic gardens which demonstrate classic design principles using a palette of primarily native plants. One of New Jersey's greatest hidden treasures can be found in Newark’s Branch Brook Park, which boasts the biggest collection of cherry trees anywhere in the world. Visitors flock to the park each spring to view the reddish-pink large white blossoms. With its recurring motif of stone lions at entranceways, Buccleuch Park, the largest city park in New Brunswick, is a beautiful recreation spot for residents, visitors, and college students. Of special note to flower lovers and gardeners is the Buccleuch Mansion gardens. The Cora Hartshorn Arboretum is a 16.5 acre green oasis, home to more than 45 species of trees, 150 species of wild flowers and 100 species of birds. The Arboretum’s emphasis on native species includes majestic trees, rare ferns and wildflowers. More than three miles of trails are open to the public year round. Multi-age classes are also offered at the center. 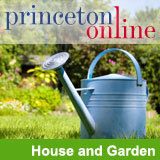 Deep Cut Gardens is dedicated to the home gardener and provides help and information. The 54 acres of gardens and greenhouses are planned as a living catalog of cultivated and native plant materials to be observed through the seasons. Daniel Webster Langton, one of the eleven founding members of the American Society of Landscape Architects, designed Drumthwacket's entire property, including woods, ponds, lawns, paths, bowling green, lawn tennis court, and formal Italianate gardens directly behind the house. In Langton's plan, the parterres of the garden were modeled after the Villa Gamberaia in Settignano, Italy. The dimensions are identical, but the details from Italy were adapted to New Jersey. This early 18th-century gambrel roof farmhouse and tavern near the Delaware River was owned by Garret Johnson, who operated a 490-acre colonial plantation and a ferry service across the river in the 1700s. The site also includes an 18th-century kitchen garden. This 127-acre facility includes a Colonial Revival home on the National Historic Register, many nature trails, themed gardens, plant collections, an art gallery and gift shop. Year round classes for all ages and a horticultural reference library make The Frelinghuysen a regional center for horticulture. Greenwood Gardens, once a grand estate of croquet terraces, tea houses and fountains enjoyed by a lucky few, is now a 28-acre garden open for guided tours, horticultural workshops and cultural events. Owned and operated by a nonprofit organization working to forward conservation throughout the region, Greenwood is a secret garden just waiting to be discovered by you. Grounds For Sculpture, a 35-acre sculpture park and museum, has captivated visitors since 1992, and has only gained in popularity as more of the public discovers its tranquil setting and engaging sculpture. Indoor Exhibitions of emerging and well-known artists are shown throughout the year in two expansive, glass-walled buildings that were once exhibit halls for the New Jersey State Fair. Over 230 contemporary sculptures, from monumental to smaller scale, can be found on the beautifully landscaped grounds. Open Tues-Sun 10-6 Nov-March and Tues.-Sun. 10-8 April-Oct. The Holmdel Arboretum featuring hundreds of species of cultivars (species derived by a horticultural process, as distinguished from a natural variety). The Arboretum has an educational and horticultural display devoted to trees, shrubs and woody plants growing in Monmouth County. For Azalea lovers, the first rate Jay Pratt Azalea Gardens in Sharptown features more than 400 varieties cultivated on private lands. The gardens are open for viewing in May. The largest annual garden in the U.S. Leaming’s Run celebrates nature’s beauty with 25 individually designed and expertly crafted gardens in harmony with the pristine native woodland setting. Each visit is unique with even changing vistas throughout the season. Leonard J. Buck Garden is a 29-acre rock and woodland garden developed by its namesake during the mid-twentieth century. The garden features naturalistic plantings of native wildflowers, shade perennials, ferns and rock garden plants. The Lewis W. Barton Arboretum at Medford Leas offers collections of rare trees and shrubs, preserved woodland areas, meadows and 33 uniquely designed courtyard gardens. Open to the public from 9 am to dusk year round at no charge. Longwood Gardens is dedicated to preserving the spirit and beauty of the early 20th century gardens of Pierre S. du Pont. Today Longwood Gardens consists of 20 outdoor gardens and 20 indoor gardens within 4 acres (16,000 m©˜) of heated greenhouses, known as conservatories. It contains 11,000 different types of plants, fountains and has extensive educational programs including horticultural career training and internships. It hosts 800 horticultural and performing arts events each year, from flower shows, gardening demonstrations, courses, and children’s programs to concerts, organ and carillon recitals, musical theatre, and fireworks displays. Once known as Skylands Farm, an estate in the grand manner, this 96-acre garden features a 44-room Tudor Revival granite mansion designed by John Russell Pope. Skylands has formal and naturalized gardens and is surrounded by more than 1,000 acres of meadows and woodlands containing approximately 5,000 species and varieties of trees, shrubs and flowers. The grounds surrounding Prosepct House present an array of trees, bushes, plants and flowers from the commonplace to the exotic. While the garden has been shaped and changed over the years by Prospect’s various owners and residents, many of its trees predate the house, notably the Tulip trees and the American Beech, which are native to the area. The flower garden at the rear of Prospect was laid out in approximately its present form by Mrs. Woodrow Wilson after her husband had the iron fence erected around the garden’s perimeter. Mrs. Wilson was the one who laid out the garden in the shape of the University Seal, so that, when viewed from above, the pathways define the shield outline. Reeves-Reed Arboretum is comprised of a historic home, restored formal gardens, greenhouse and woodlands. Its mission is to provide horticultural and environmental education and to foster the enjoyment of nature through professional care and preservation of the property. The Rockingham State Historic Site is a recreated farmstead that contains a Mansion House, Children's Museum and gardens. The property adjoins the D&R Canal towpath in Somerset county and provides a combined natural and cultural experience for visitors. Visitors can explore the use of medicinal herbs, vegetables used for meals and field crops while exploring the recreated 18th century kitchen garden. This 50-acre garden opened in the 1930’s as a series of teaching collections in currently being re-designed to serve both students and the community. Included are shrub, annual, perennial, mixed border, rhododendron, evergreen and bamboo gardens. Adult education classes, tours, special events and rentals are offered. Sayen House and Gardens is a beautiful attraction throughout the spring. Filled with azaleas and rhododendron brought from China, Japan and England they highlight a collection of colorful blossoming species providing a feast for the eyes. The gardens hold some 2,000 azaleas and 1,500 rhododendrons of hybrid and native species. The grounds are dotted with fishponds, gazebnos and walking trails. The house was built in 1912 in the bungalown style and Hamilton's annual Azalea Festival takes place here each Mother's Day. Sister Mary Grace Burns Arboretum is located on the campus of Georgian Court University. Its 155 acres contain a good collection of native plants of the New Jersey Pinelands. Many kinds of oaks and pines, well adapted to this unique ecosystem are contained in its collection and may be viewed along its nature trail. The Gardens are located on the Cross Estate, site of the New Jersey Brigade Unit of Morristown National Historical Park, on Old Jockey Hollow Road in Bernardsville, NJ. The Gardens are open from dawn to dusk. Parking is free, and there are no entry fees. The early twentieth-century landscape of the Cross Estate, characteristic of the Arts and Crafts period, includes a formal perennial garden, a wisteria-covered pergola, a mountain laurel allee, and a garden of native plants. The Presby Gardens features a collection of more than 4,000 varieties of world-famous irises, some dating back to the 1500's. The Gardens also boasts an unmatched array of well-known and rare irises, which has earned it National Historic Site designation. Van Vleck House & Garden is dedicated to preserving for public enrichment, the spirit and beauty of this late 19th and early 20th century house and gardens. Continuing the Van Vleck family’s commitment to the community and to horticultural excellence, the house serves as a center for nonprofit organizations and the gardens are open to the public for display, education and research. Currently in development, the Wagner Farm Arboretum plans to open in 2007. It is dedicated to the environmental and horticultural education of children and adults through the collection, study and display of trees, shrubs, flowers and other plant life in order to promote community involvement and environmental awareness. Please call for updated information. For rose lovers there's the Wallbridge Rose Garden in Millburn. The farm features a multitude of herbs and perennials, display gardens and gift shop. The shop is filled with an assortment of dried flowers, wreaths, statuary, hard-to-find potpourri supplies and unusual gifts for all ages. The farm also has high-quality plants and a broad selection of craft, garden, plant and medicinal herb books. More than 3,500 kinds of native and exotic plants may be seen at this 134-acre property, which includes a Federal style residence, circa 1783. Collections include lilacs, hollies, magnolia and viburnum. The arboretum is home to many Champion trees, an assortment of garden statuary and a small jewel-like conservatory, Willowwood is a plant lover’s dream.